This cocktail starts out with an Absinthe fire wash; setting a spirit on fire lets it release its natural essence. Saint George Absinthe is extremely earthy and herbaceous and it not only comes from my favorite island, Alameda, California, but in all sincerity it’s the best absinthe in the world. Tanquray Ten is added as the main spirit, it is juniper forward, followed by dry citrus notes from its high-grade distillation process and then leaves your taste buds with a distinct peppery finish. Juicy, Heirloom tomatoes add a layer of luscious full-bodied flavor. This cocktail’s fourth component is Aloe Vera juice to provide a natural sweetness. It is syrupy in its natural state and very sweet. A finishing of touch celery bitters and a pinch of salt make every taste in this cocktail come alive. Far from a Bloody Mary, or heavy grainy tomato feel in your mouth this cocktail calls for a deep sigh after the first sip. Go ahead, stretch your legs out, put your feet up, let your shoulders fall, and get ready for ultimate bliss. 3 oz. Heirloom tomato puree – fine strained. Pour 0.5 oz of St. George Absinthe into a rocks glass, swirl it around to coat the inside of the glass. Holding the glass at a diagonal angle, light a match and set the absinthe on fire. Roll the glass so the flame touches all sides. Let absinthe burn a minute or until the flame goes out, which ever happens first. Add the remaining ingredients into a shaker with ice and shake well. Put ice into the rocks glass and fine strain the cocktail into glass. 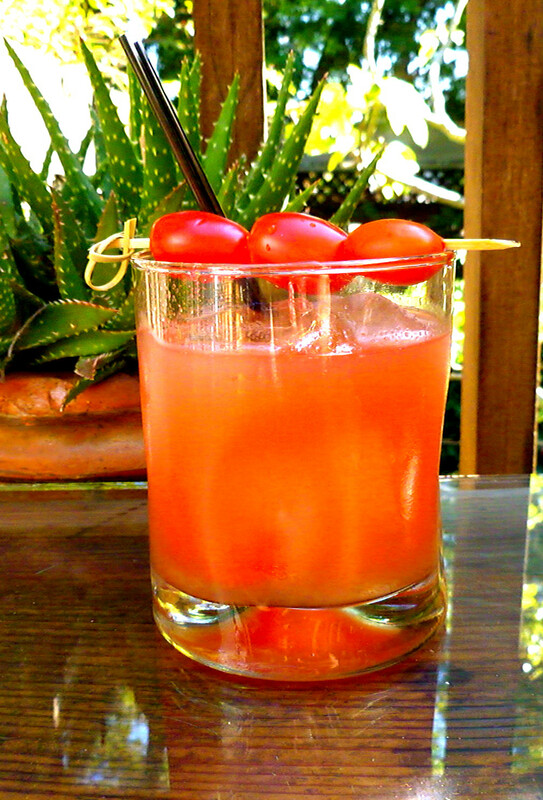 Garnish with cherry tomatoes.